Newcastle City Council are proposing improvements for the north of the city centre and are asking residents and visitors to provide comments on their proposals. The amount of traffic going into the city centre directly affects how much traffic we see (and how much pollution we breathe) on Gosforth’s streets. 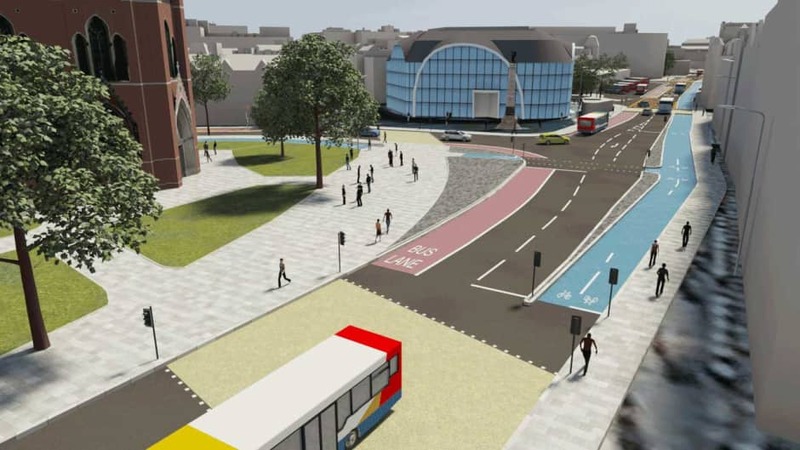 Providing safe and attractive alternatives in the city centre, such as improved cycling facilities or more reliable public transport, should also help reduce traffic and pollution in Gosforth. SPACE for Gosforth does not comment as a group on the Council’s plans so if you want these changes to happen, or to provide feedback, you will need to log on to the Commonplace website and share your view. You have until Sunday 8 November to do this. Thirty people from SPACE for Gosforth got together on Monday night to talk through the plans. While there are some detail points we think need looking at, overall we’re feeling very positive about what the Council are trying to do in the city centre. The proposals cover five different areas with feedback being requested on each. Most of the comments below apply to all of the areas but where specific this is marked in square brackets. Feel free to use or reference these as you wish in your response – or add to them or challenge them by leaving a comment here or on the SPACE for Gosforth Facebook page. These are the things we liked. Restrictions on through traffic should make the city safer and more attractive for walking, cycling and for shopping. Access is still provided for those who need to use the city centre car parks. Reduced through traffic should mean fewer hold-ups for buses. The same should apply for deliveries and car-shoppers. The cycle lanes that help keep cyclists safe and link up to other routes into and around the city. The same shared space point applies, though to a lesser extent, on Claremont Road [C] . The marking of shared space needs to show very clearly the desired route to be taken by cyclists and that, in that shared space, priority should be given to pedestrians e.g. cross hatching to look like a zebra crossing. Ideally all the cycle tracks should be designed so that families and less confident cyclists feel safe using them. Any plans to encourage cycling should include cycle parking. We would encourage any attempt to introduce more trees or greenery into the city centre. We wanted to make sure that deliveries could still be made efficiently while maintaining the priority of making the city safer and more attractive for walking and cycling.